Photos from Walk About Brain Injury event on March 12, 2016. 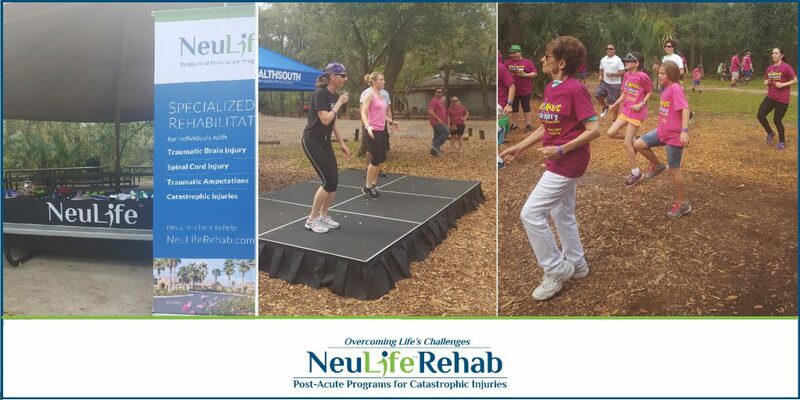 NeuLife Rehab participated in the Walk About Brain Injury event on Saturday, March 12. The event was held at Lake Lotus Park in Altamonte Springs, Florida, with the purpose of raising awareness surrounding brain injuries. The event also honors brain injury victims and their friends and families. More than 215 people participated and according to an announcement from the Brain Injury Association of Florida (BIAF), more than $14,900 was raised. According to the BIAF, there are 214,000 families living with life-long effects from traumatic brain injury (TBI) in Florida alone. It’s estimated that this year, another 136,000 Florida families will be affected by TBI through sports, combat, motor vehicle crashes and falls. BIAF works to help prevent and treat TBI by raising awareness and supporting the families left victim to its consequences. You can learn more about the Brain Injury Association of Florida, Inc. (BIAF), by visiting their website. March is also known as Brain Injury Awareness Month – find ways to raise awareness! NeuLife is a Residential Post-Acute Rehab organization specializing in catastrophic rehabilitation for Traumatic Brain Injury, Spinal Cord Injury and other complex injuries. Its Program includes Physical, Occupational, Speech, Cognitive, Vocational, Counseling, Dietary and Behavioral Services and more. Beautifully situated on 43 acres in Mount Dora, Florida, its inpatient rehab facility comprises over 60,000 square feet and 54 private rooms. If you would like more information about NeuLife Rehabilitation Services, please contact us.